Thanks to its iconic looks and space-saving nature, the Smart fortwo is not going to be for everyone. However, for drivers who need a car that thrives in the city, is practical enough for everyday use and is economical to run, the fortwo may well be the perfect solution. Why not get behind the wheel today by contacting a member of the team at Auto Xchange to arrange a test drive. 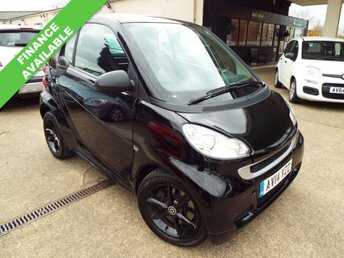 You can also view our complete stock of used Smart fortwo cars for sale in Derby here on the website and speak to a member of the team if you have any questions. For great deals on quality used cars, we're the name to trust. Finance is available to UK residents aged 18 years or older, subject to status. Terms & Conditions apply. Indemnities may be required. Other finance offers may be available but cannot be used in conjunction with this offer. We work with a number of carefully selected credit providers who may be able to offer you finance for your purchase, commission may be received. We are only able to offer finance products from these providers. Postal Address: Auto Xchange , 128 London Road, Shardlow, Derby, Derbyshire DE72 2GP. Find contact details here. Auto Xchange is authorised and regulated by the Financial Conduct Authority, FRN: 655052. All finance is subject to status and income. Written Quotation on request. We act as a credit broker not a lender. We work with a number of carefully selected credit providers who may be able to offer you finance for your purchase. We are only able to offer finance products from these providers.